Hand moldable to different shapes & sizes. Cures automatically for a long lasting seal. Can be sanded, painted upon to suit the surface. 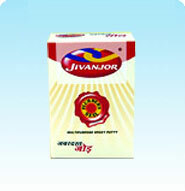 Withstands temperature up to 120 Deg C.
Leaves a pleasing fragrance on hands after use. Seals, joins and repairs GI pipes, PVC pipes, glass, granite, ceramics, concrete etc. Seals leakages in flush tanks, water pipes, and washbasin and storage tanks. Fills cracks between tiles joins granite, ceramics & glass.